We haven’t owned a TV in many years, but since we’ve had Netflix, we’ve been exploring a few television series which appeal to our interests. 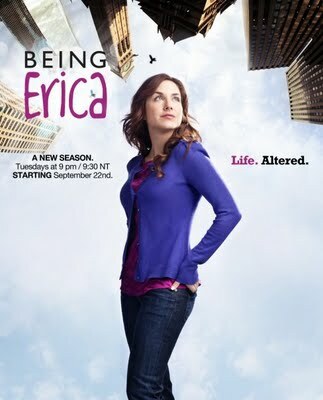 We’re always looking for artistic portrayals of the various aspects of Heilkunst, and last night we stumbled across a TV Series called Being Erica, which seems to be a brilliant depiction of our process of time line treatment. The first episode (as far as we’ve gotten, so far) lays out the story — our heroine, Erica, feels that all of the mistakes she has made has brought her life to one dead-end after another : her job, her lack of relationship, and appearing to be the black sheep in her family culminate in a series of misfortunes during this opening episode. Coming to in the hospital after being revived from an anaphylactic reaction from a nut allergy, she is approached by a mysterious figure, who tells her that he’s “sort of” a doctor, and can help her. He invites her to come and try his unconventional form of therapy, in order to get her out of her life funk. Hints of magic (ie non-realism) mount towards the point where she is in this therapist’s office, and asked to write down a list of all the big regrets that she is still carrying from her life. To the Heilkünstlers in the audience, this looks very much like a time line of traumatic events and emotional shocks, which we use as the backbone of treatment. He chooses one particularly pivotal event, and the next thing we know, she has woken up in her old teenaged life, the day of one of her big regrets in question. After a few disorienting encounters, she figures out that she has been sent back in time in order to relive this event, but to change the ending through different choices and actions. Without revealing the rest of the plot of this episode, I’d like to say that it was a very good artistic depiction of our time line treatment, where each time line remedy will send the patient back in time. Although we cannot literally change our past, we can change our consciousness of it, as far as it has a continuing effect on how our mind or body functions in the present. Like the show Being Erica, and unlike traditional talk therapy, it is not sufficient to just talk about these events from the past, but to employ an agent which provokes a living experience for the patient, from which a true change of mind and heart can be gleaned. This show is fairly light in tone, but nevertheless caries a powerful artistic message, if you have something real to connect it to. The same is true for so many ‘fluffy’ Hollywood films, but if read correctly, often can reveal basic archetypes about human conflicts and struggles. We’re looking forward to continuing on watching this series, so please don’t spoil any of the upcoming plots in the comments below! « A Journal of Best…. Compensations?